SCVHistory.com AL1101 | L.A. Aqueduct Worker Sends Postcard to Mom from Jawbone Division (Mojave Desert), 1911. As of 2019, the family home at 1143 Fedora Street still stands, although it was enlarged in 1925. Such a good boy. Frank Hood, a worker on the Los Angeles Aqueduct, writes home to his mother, Mrs. Forrest Hood of the Pico Union section of Los Angeles, from a construction camp at Water Canyon in the Mojave Desert. Cinco, mentioned in his note, was a railroad siding about 16 miles north of the town of Mojave, between Mojave and the Jawbone Siphon. 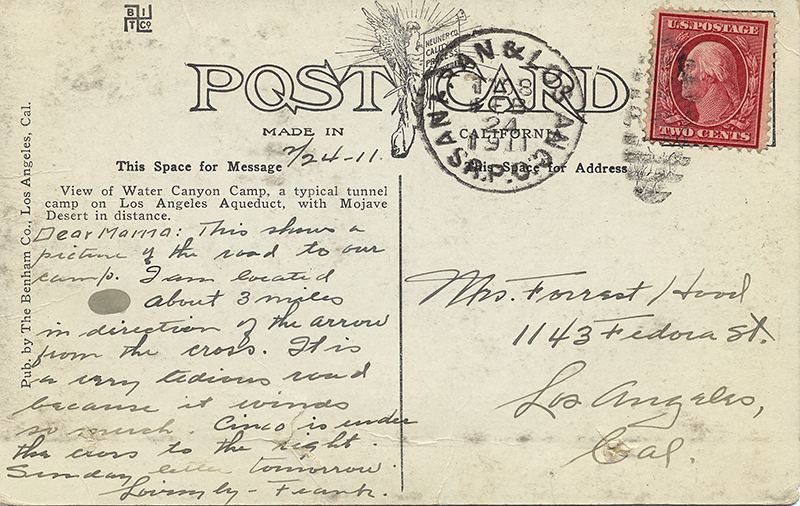 The postcard was mailed February 24, 1911, from the San Francisco & Los Angeles RPO (Railroad Post Office). A Railroad Post Office was (usually) a passenger car in/from which mail was picked up, sorted and delivered. The Nevada & California Railway served Cinco Station, which was the headquarters of the Jawbone Division and supply station with a machine shop and hospital. 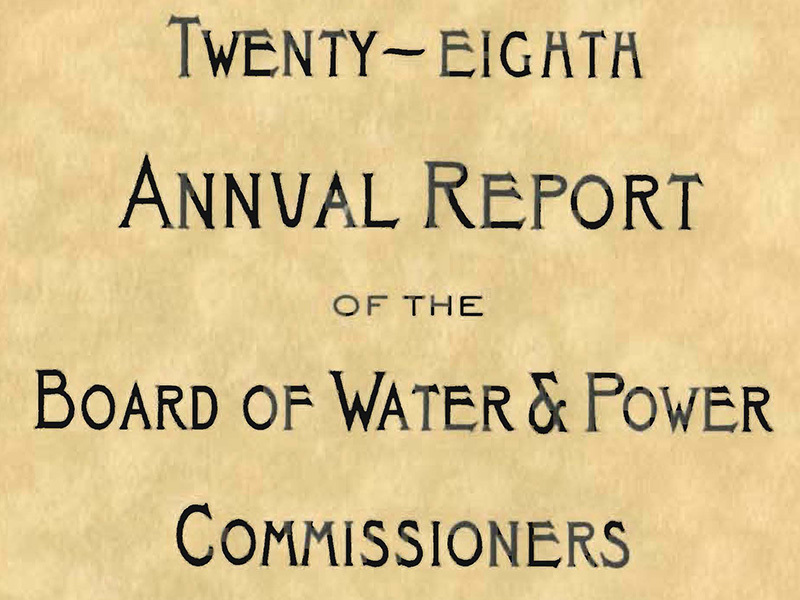 (Source: Third Annual Report of the Bureau of the Los Angeles Aqueduct, 1908.) In addition to mail, the railroad delivered sections of aqueduct pipe. The Jawbone Division "consists of 59,448 feet of tunnel, 44,717 feet of conduit, 13,448 feet of siphon and 250 feet of flume" (ibid.). Work in the division started in September 1908 and was expected to be complete by January 1, 1911. Since Mr. Hood's postcard is dated February 1911, we can assume they didn't quite make it. Postcard published by The Benham Co. of Los Angeles. 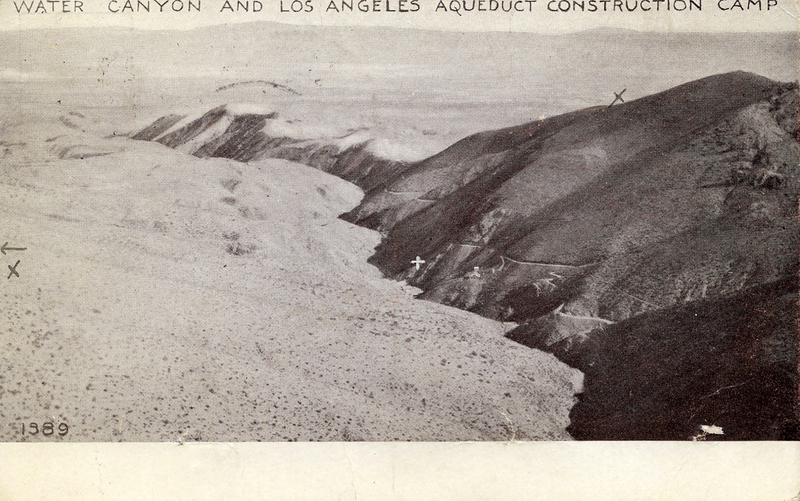 Printed description back: "View of Water Canyon Camp, a typical tunnel camp on Los Angeles Aqueduct, with Mojve Desert in distance." This shows a picture of the road to our camp. I am located about 3 miles in direction of the arrow from the cross. It is a very tedious road because it winds so much. Cinco is under the cross to the right. AL1101: 9600 dpi jpeg from smaller jpeg. Collection of Dr. Alan Pollack.